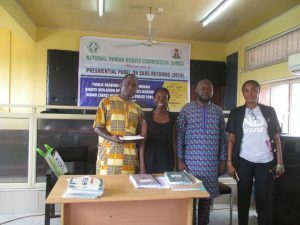 Few days after an Urban Security Summit organized by Spaces for Change | S4C in August 2018 exposed the injustices perpetrated by Nigerian security operatives in Lagos’ informal settlements, the National Human Rights Commission (NHRC) announced its intention to set up an investigative panel to redress human rights violations committed by members of the Special Anti-Robbery Squad (SARS) of the Nigerian Police Force. Within the same period, Vice President Yemi Osinbajo issued directives on the 14th of August 2018, for the immediate overhaul of SARS following an avalanche of allegations against the Nigerian Police Force by members of the public. NHRC’s investigative panel, named the Presidential Panel on SARS Reform, held over a five-day period, began on the 13th of November 2018 at a public hearing held in Lagos, Nigeria. Over thirty complainants comprising private individuals, non-governmental organizations, stakeholders in the security, judicial and civil society sectors, filed petitions, and testified at the panel. 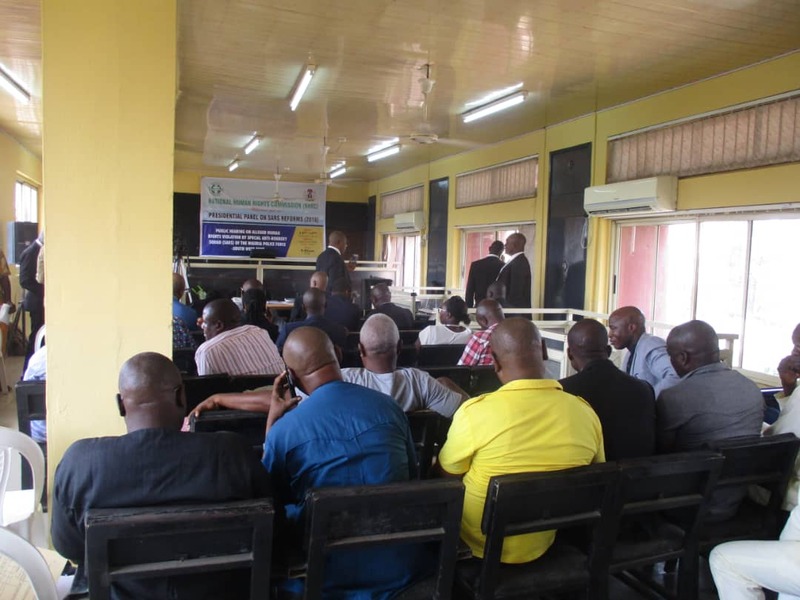 SPACES FOR CHANGE filed eight petitions on behalf of its client communities comprising mainly of Lagos informal settlements that are routinely raided by security forces in the name of crime-fighting. Every raid is accompanied by series of arrests, detentions, and imprisonment of local residents for flimsy or no reason at all. In his opening speech, NHRC’s Executive Chairman, Mr. Tony Ojukwu, stated that the panel was set up to investigate the veracity of allegations of human rights abuses levelled against SARS in the last two years, while also offering citizens a window of opportunity to access justice, accountability and fair hearing where there is evidence of a misconduct by any public institution or its agents. Six out of the eight petitions that S4C filed centered on unlawful arrests, detention, criminal extortion and degrading treatment of slum dwellers by security agents. All eight petitions were listed for hearing, with S4C offering free legal representation to all the affected persons. S4C’s Legal Officer, Ms. Sola Mercy Olutayo Esq. represented all the complainants at the hearing. S4C’s first matter to be heard was the case of Idowu Makonjuola against F-SARS Lagos, Commissioner of Police Lagos State and Inspector General of Police. Idowu Makonjuola, a resident of Badia-East in Lagos, runs a viewing centre in Badia-East community in Ijora area of Lagos State. Sequel to a personal friction with an acquaintance who ‘has police friends’, his viewing centre was raided several times by policemen from different police divisions and commands in the guise of searching for guns and dangerous weapons. Even though, nothing was ever found, the police raids assumed a frequency and pattern of extortion that culminated in the destruction of most his business assets, unceasing arrests and detention of customers found within his business environment while monies running into millions of Naira were extorted from him in exchange for freedom for over three years. 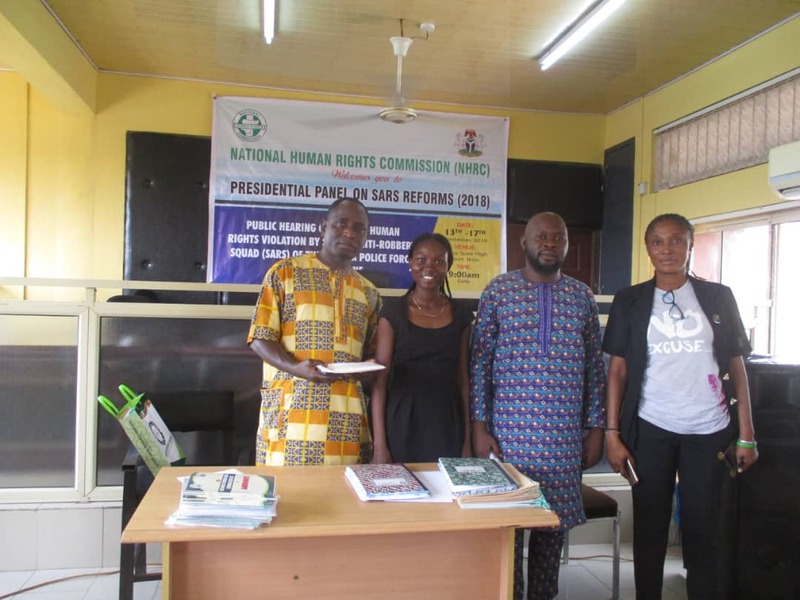 Makonjuola’ case attracted significant media attention and the interest of the NHRC and Lagos State legal aid agencies when it was first uncovered at an Urban Security Summit organised by Spaces for Change in August 2018. However, the absence of the alleged SARS officers (Dada and Dogo) at the court sittings in Lagos led the panel to adjourn the matter to its next hearing in Owerri, Imo state. The hearing is scheduled to hold between the 27th day of November to 1st of December, 2018 and respondents were ordered to make available the accused officers at the next hearing to enable the panel arrive at a decision. The second case was that of Comrade Agbodemu against F-SARS Lagos, Commissioner of Police Lagos State and Inspector General of Police. Agbodemu narrated to the panel how he was unlawfully arrested, beaten, extorted and cruelly-treated while in detention by a SARS official, Inspector Umaru Paiko. The accused officer was present in court and also gave testimony. After hearing both parties, the panel decided in his favour, and mandated the SARS official to refund the sum of N130, 000 to the complainant, Mr. Agbodemu. The third case of Samuel Tamidun and nine others against the F-SARS Lagos, Commissioner of Police Lagos State and Inspector General of Police also revolved around unlawful arrests, detention and degrading treatment of community chiefs and residents by SARS officials. The complainants, representatives of Ito-Agan community in Apapa area of Lagos narrated how security operatives invaded their community, arresting residents over conflicts arising from traditional kingship tussles and land disputes between native chiefs. These arrests were however, exploited, with security operatives taking sides with one of the warring parties and in the process, brutalising, extorting and intimidating community members which led to evictions and scores of displaced victims. The panel adjourned the matter to its next sitting in Owerri because the alleged perpetrators did not show up in court. At the end of the public hearing, the NHRC panel commended complainants and organizations for the courage to lodge their grievances and submit memoranda despite reported cases of intimidation. It also acknowledged the efforts of the Inspector General to sanitize the Nigerian Police. The NHRC Chairman extended his appreciation to partnering government agencies and non-governmental organizations like Spaces for Change whose constant campaign against the activities of SARS have kept human rights issues on the front burner, and prompted the setting up the panel. The organization welcomes the NHRC panel’s specific mention and recognition of SPACES FOR CHANGE’s frontline advocacy to protect and defend the rights of low-income and vulnerable residents of informal settlements in Nigeria, and regards it as a clarion call to do more.